The "Big 3" have all made the same big decision. And now, it's up to the Miami Heat to keep their star trio happy. Dwyane Wade and Chris Bosh told the Heat on Saturday that they are opting out of their contracts and will become free agents on Tuesday — the same decision that LeBron James revealed earlier in the week. Also Saturday, Udonis Haslem told the Heat that he will not pick up his $4.6 million option for next season. Strange as it may sound, all those decisions to become free agents are considered good for the Heat, since those four moves alone free up about $66 million in what would have been salary for next season. It also gives Miami tons of flexibility to lure those players back into new deals — plus have enough money left over to make additional roster upgrades. "Today we were notified of Dwyane's intention to opt-out of his contract and Udonis' intention to not opt into his contract, making both players free agents," Heat President Pat Riley said. "Dwyane has been the cornerstone of our organization for over a decade, and we hope he remains a part of the Heat family for life. Udonis has been the heartbeat of this team for 11 years. He has sacrificed countless times to make this organization successful, and he is the epitome of what this organization stands for. "We look forward to meeting with Dwyane and Udonis and their agent in the coming days to discuss our future together." 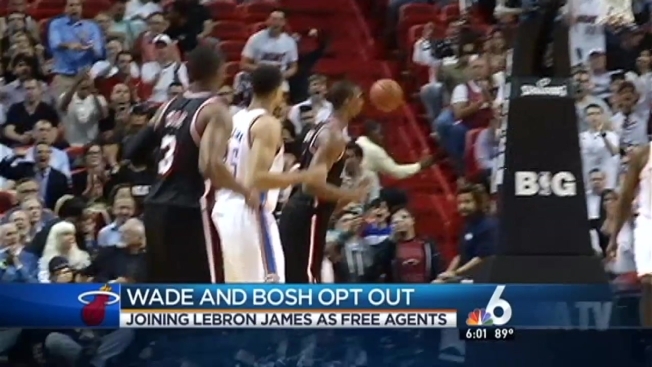 The Heat did not immediately confirm Bosh's decision. A person with knowledge of the move said Bosh told the Heat that not only is he opting out, but that he is hoping to find a way to stay in Miami. "We want this to work out and I think we'll find a way to get it done," Bosh told The Associated Press shortly after the Heat fell in the NBA Finals to the San Antonio Spurs. Haslem expressed the same sentiment. "We all want the same thing around here," Haslem said at the end of the season. It's expected that each of the "Big 3" will talk to other teams when the free-agent shopping window opens Tuesday. James has already been mentioned as a target of the Los Angeles Clippers, the Chicago Bulls, the Houston Rockets — and, of course, the Cleveland Cavaliers, the team for whom he spent his first seven seasons before he, Wade and Bosh teamed up in Miami during the summer of 2010. But things are already looking good for Miami, which got the rights to former Connecticut guard Shabazz Napier on draft night — and Napier just happened to be James' favorite player in the draft. In the deals they signed with Miami, all three had the option to become free agents either this summer or next. There's obviously no guarantee that all or any would return to the Heat now, but it's also hard to envision all three going their separate ways after making four trips to the NBA Finals together and winning two championships. "We've got a lot of room for flexibility," Riley said as the offseason was starting. "There is a tremendous amount of flexibility depending on what happens. We're ready. Now, do I feel any pressure? No, I don't. I don't feel any pressure at all. I'm going to do the best job that I can do and we will all do the best job we can do. I don't think we have to recruit Chris and LeBron and Dwyane again. "I'm not dropping championship rings on the table for those guys," Riley added, referring to his famous recruiting trick from 2010. "They can drop their own." Wade took a considerable amount of criticism this past season, first for missing 28 regular-season games — largely because of what the Heat called a maintenance program for his long-problematic knees — and then for struggling in the NBA Finals. Wade averaged 24.3 points per game in his first 11 seasons and is unquestionably the most accomplished player in Heat history, leading the franchise's all-time lists in several categories. Riley calls Wade "an icon" and remains sold on his value to a championship team, though acknowledges that at 32 and with plenty of injuries in his past, some continued evolution to his game — and perhaps his role — could be needed. "He does have pain but he doesn't have the debilitating injury that could end his career," Riley said.